Mopar, Fiat Chrysler Automobiles' in-house parts and accessories division, has been on a tear lately, coming up with unique offerings for nearly every model in the vast FCA empire. 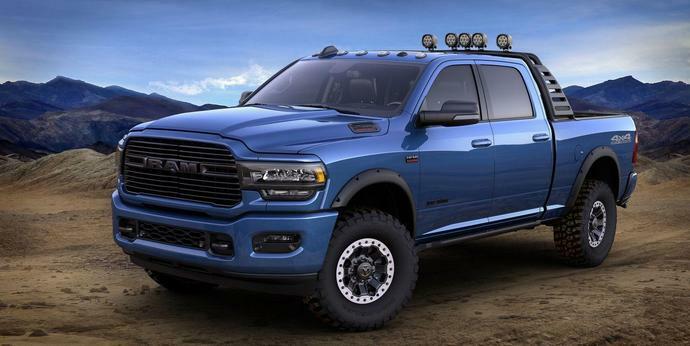 The latest vehicle to get the Mopar treatment is the 2019 Ram 2500 Heavy Duty with a 6.4-liter Hemi V-8, which the FCA division prepped for the 2019 Chicago auto show. Mopar used a Big Horn trim crew-cab, short-bed model as the canvas, clad in a coat of Blue Streak paint. They fitted a black powder coated Ram Bar behind and topped it with a quintet of five-inch LED lights capable of piercing the night with 4800 lumens each. A Mopar retractable rear bed step provides easy access to the bed, and wheel flares add to the rugged look while providing another layer of defense against trail rash. Hinting at future product are the powder-coated rock rails and 17-inch custom milled beadlock wheels-there's a spare in the bed, too, anchored by a concept spare carrier. That's all still in the concept stage but will likely make production if public response is favorable. Interior features include Mopar brushed stainless-steel sill guards emblazoned with the RAM logo and husky waterproof floor mats. Ram wants you to know that Mopar worked closely with Ram brand engineering and the Product Design Office to develop products for the 2019 Ram HD, a process that included tens of thousands of hours of testing and access to factory-exclusive data. In other words, this gear is engineered form day one and likely far superior to the one-size-fits-all gear available from your local mass-market discount retailer. Additional Mopar accessories currently available for 2019 Ram HD models include bed extenders, bedliners, cargo ramps, a trailer camera, a fifth-wheel hitch, a gooseneck ball kit, heavy-duty splash guards, side steps, tonneau covers, toolboxes, a trailer camera, and wireless charging.